She stood like a statue beside the car and smiled the most perfect smile I had ever seen, in the most glamorously impeccable black dress ever worn. It was dazzling, she was dazzling, and yet somehow, in a crowded room of men, no one even noticed her. She was just another beautiful person in a sea of coifs and collars, an Island of Lamborghini in the sea of chaos called the 2006 Detroit Auto Show. They were the beautiful people, and they were safe from it all, safe and serene, while all around them the harried hustle and bustle of the car business went on. Lamborghini, after all, is not in the car business. They are in the beautiful people business, and they happen to make cars, super cars, for super beautiful humans. And the one my dear model stood beside happened to be perhaps the most beautiful of all the Lamborghini creations on display: the reprised, revisited and regaled Miura Concept. 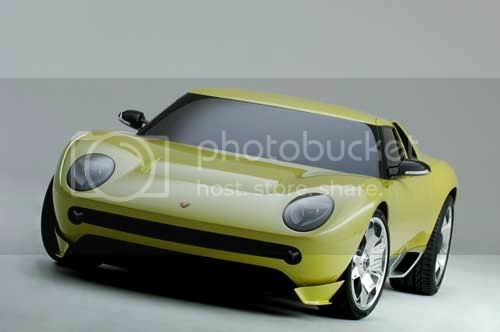 Done to celebrate the original Miuraâ€™s 40th anniversary, the concept is only a design study, but may become real, judging from the enthusiastic reception it received at the conference, and because, well, beautiful people love beautiful things. The also pay, often dearly, for the most beautiful of these things, and the Miura is certainly that â€“ a lime cream masterpiece with tough-guy haunches and a broad back that has power written all over it â€“ another thing the beautiful love to covet. Created by a team led by Audi Group chief of design, Walter deâ€™ Silva, if made into a production car, the Miura will likely ride on the chassis of the Audi R8. If itâ€™s built, look for it late in 2007. Concept specs call for an all-wheel-drive setup, a base price of around $800,000, and a powertrain driven by a 6.5-liter, 700-horsepower V12 engine with a sequential seven-speed automatic transmission. Did you notice the car said Mitsubishi on it. That\\\\\\\'s reason enough to walk away. Speed runs through my veins..... Memba dat..
Two wrongs don\\\\\\\'t make a right, but three lefts do. toe tall foe creeeee !!! Its dead. No plans for production. GURL INNA DI CAR WID DI HEADERZ...SHE A GIMMI HEADERZ!!! !